Learn and practice likely TOEFL and IELTS vocabulary on the pages below to prepare for either exam. Crosswords can help you review vocabulary. 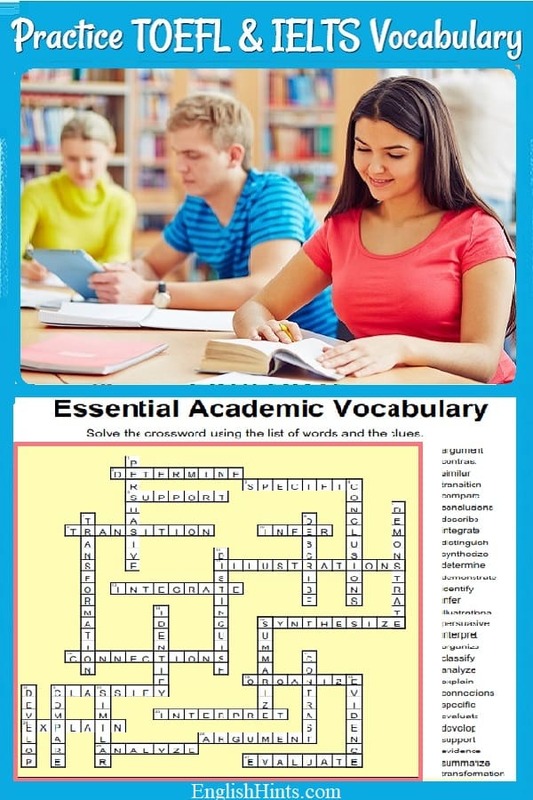 •	academic vocabulary practice for the TOEFL and IELTS and for university study and professional work in English. Both sections are arranged with related pages together. They generally start with easier vocabulary and then give pages with more difficult words to practice. Both the IELTS & the TOEFL sections will have many pages that can help you prepare for either exam. • Basic Family Vocabulary. (A good visual family tree to explain aunts, uncles, cousins, nephews, etc. For informal family terms (Mon, Dad, Nana, etc.) see English Detective Back Issues, #119-- Dec.4, 2018-- the second section after the campfire photo. •	Practice (and Play with) Negative Prefixes. •	British Power Vocabulary Exercise. Most of these pages use somewhat less common academic vocabulary—and a lot of words at once. Don’t start with these, but do try them once you know most of the more basic words above. They are also from the Academic Word List, and will be used in textbooks, university lectures, and on tests like the TOEFL. Recognizing common roots, prefixes, and suffixes can increase your vocabulary fast! Make sense of words like access, advocate, deduce, inquiry, intervention, revert, and sustainable by learning and practicing with the Latin roots they come from. Crossword Puzzles are a great way to make vocabulary study more fun. These can be printed for practice offline. Learn the English vocabulary & skills you need for a better score on the TOEFL or IELTS.